Two peas in a pod. Bottlenose and Atlantic spotted dolphins spend lots of time together in the Bahamas. They play and forage together, babysit each others calves and even hybridize on rare occasions. Bahamas. Galapagos sea lion (Zalophus californianus). Galapagos Islands. Three spinner dolphins (Stenella longirostris). Hawaii. Indo-Pacific bottlenose dolphins (Tursiops aduncus) off Oahu. In 1998, the the Indo-Pacific bottlenose dolphin was recognized as a separate species. Before then, the genus Tursiops was monospecific. The Indo-Pacific bottlenose dolphin is generally smaller than the common bottlenose dolphin. Hawaii. A pod of spinner dolphins (Stenella longirostris ) cruises over sand bottom in Hawaii. A spinner dolphin (Stenella longirostris) plays fetch with a leaf. Hawaii. Two Atlantic spotted dolphins (Stenella frontalis) up close in beautiful, clear blue water. Bahamas. Two Atlantic spotted dolphins (Stenella frontalis) up close in clear, blue water of the Bahamas. Humpback whale (Megaptera novaeangliae) calf fully breaches out of water. Tonga. 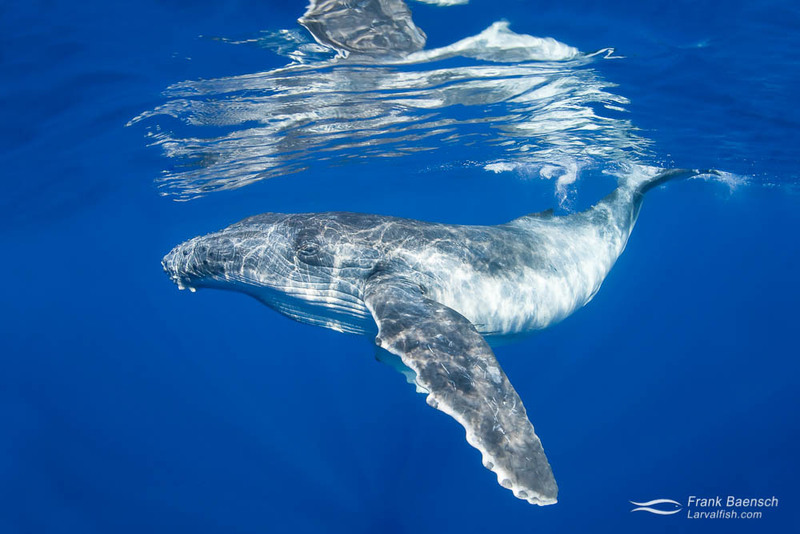 Humpback whale calf (Megaptera novaeangliae) plays on the surface in Tonga. Galapagos sea lion (Zalophus wollebaeki). Galapagos Islands. Spinner dolphin (Stenella longirostris) pod over sand in Hawaii. A young Galapagos sea lion (Zalophus wollebaeki) blowing bubbles. Galapagos Islands. Spinner dolphin (Stenella longirostris) pod reflection in Hawaii. Close up of two Atlantic spotted dolphins (Stenella frontalis) above sand bottom. Bahamas. A Hawaiian spinner dolphin (Stenella longirostris) pod swims over sand. Hawaii. Galapagos sea lion (Zalophus californianus) surface reflection. Galapagos Islands. Silhouette of two spinner dolphins (Stenella longirostris) under clouds and blue sky. Hawaii. Head on shot of playful Hawaiian monk seal (Monachus schauinslandi). Hawaii. Galapagos sea lion (Zalophus wollebaeki) diving down from the surface. Galapagos Islands. Hawaiian monk seal (Monachus schauinslandi) swims over rocks in shallow water. Hawaii. Hawaiian monk seal (Monachus schauinslandi) getting playful. Hawaii. A small pod of spinner dolphins (Stenella longirostris) over sand in Hawaii. An Atlantic spotted dolphin (Stenella frontalis) torpedos by in clear turqoise waters of the Bahamas. Free willy:) Bottlenose dolphin bull (Tursiops truncatus) courting Atlantic spotted dolphins (Stenella frontalis). Bottlenose and Atlantic spotted dolphins spend lots of time together in the Bahamas. They play and forage together, babysit each others calves and even hybridize on rare occasions. Bahamas. Four Atlantic spotted dolphin (Stenella frontalis) playing with a gorgonian branch above sand bottom in the Bahamas. Head shot of Hawaiian monk seal (Monachus schauinslandi) off Oahu. She popped her head out of a cave while I was photographing fish with my 100 mm macro. I had back off quite a bit just to get just even a head shot. She danced upright for several minutes (no doubt ridiculing me for my poor lens choice) and then gracefully swam off alomg htr sea cliffs. Hawaiian monk seal (Monachus schauinslandi) swims by curiously in the shallows. Hawaii. Humpback whale (Megaptera novaeangliae) and sunrays from below. Tonga. Bottlenose dolphin bull (Tursiops truncatus) courting Atlantic spotted dolphins (Stenella frontalis). Bahamas. A small pod of spinner dolphins (Stenella longirostris) cruise over sand in Hawaii. Two spinner dolphins (Stenella longirostris) break the surface in slow motion. Hawaii. An Atlantic spotted dolphin (Stenella frontalis) swims over white sand. Bahamas. An Atlantic spotted dolphin (Stenella frontalis) swims toward the surface over white sand in clear, blue waters of the Bahamas. Curious Hawaiian monk seal (Monachus schauinslandi) swims over rocks off the Big Island, Hawaii. Spinner dolphin (Stenella longirostris) reflection. Hawaii.